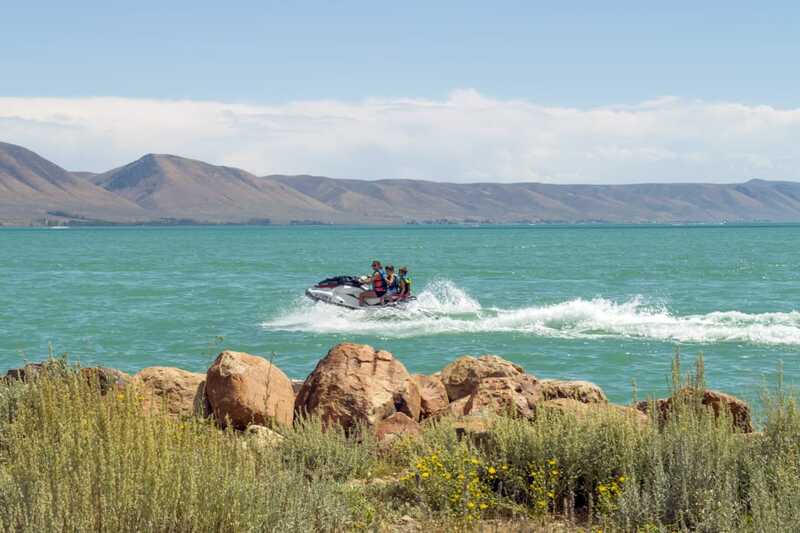 The blue, fresh waters of Bear Lake are split equally between Utah and Idaho, and have long welcomed families looking for a close-to-home vacation. But, when you and your crew are exploring the Caribbean of the Rockies, don’t miss the fun that lies beyond the beach. From reenacting life on the Oregon Trail to exploring an underground cave, there are plenty of unexpected outdoor adventures—if you know where to find them. Step back in time to the Oregon Trail era at this interpretive center in Montpelier, Idaho, where your whole family can prepare for and take a trip out West. With actors playing pioneers as your guides, you’ll shop at the mercantile, ride in a covered wagon, and spend time in an encircled wagon train at an encampment. This real-life history lesson will enchant children, and you can follow it up by stepping outside and seeing the historic Oregon/California Trail for yourselves. After visiting the National Oregon/California Trail Center, your kids can live the experience by spending a night or two in Conestoga Ranch’s luxurious wagons. Each is outfitted with a big, comfortable bed for parents and bunks to fit all the kids. At night, sit amidst the wagons around a campfire—just like the pioneers did—and gaze at the starry night sky. Thankfully, your snacks are better than the pioneers—every stay includes a s’mores kit for roasting over the fire pit. Beyond the wagons, let little ones ride around on the ranch’s free cruiser bikes, challenge each other to ping pong in the game room, and lasso fake cows with provided ropes. When you want to eat without traveling far, visit the on-site, open-air Campfire Grill, which has a diverse menu for kids. Need an easy hike for kids? Head to Limber Pine Loop for a level, 1.5-mile hike that takes you past views of sparkling Bear Lake and leads to a 560-year-old tree that is the trail’s namesake. Along the way, read the 12 interpretive signs that teach kids about Bear Lake Valley’s diverse plant and animal life. For an even simpler walk, take your tiniest tots to Garden City Park and follow the raised wooden walkway to learn about local plants and flowers. Cool off underground on a 90-minute guided tour through the nine rooms of Minnetonka, Idaho’s largest limestone rock cave. As you explore the caverns, you’ll pass stalactites and stalagmites as you climb up and down the many stairs. When you visit, be sure to bring jackets for everyone, as temperatures in the cave are a chilly 40 degrees year-round. When you’re busy wrangling kids, the last thing you want to do is haul kayaks and paddleboards to Bear Lake’s beaches. Instead, let Bear Lake Water Adventures do the heavy lifting for you. Just arrive at the beach, pick out some paddleboards and kayaks (kid-sized crafts are available), and wait for them to be delivered to your beach spot. Then, you can float the calm waters or paddle the day away, letting your littles paddle kid-sized boats if they’re feeling brave. When you’re ready to move beyond the beach, drive north to the lake’s Idaho side to the Bear Lake National Wildlife Refuge, a prime birdwatching spot. Start your tour by following the auto loop to see geese, Trumpeter Swans, Great Blue Herons, and Ibis flying by. Then, take to the walking trails with the kids, crossing over the river on bridges and stopping in covered resting spots where you can watch the animals—without them watching you. Sure, Bloomington Lake’s a bit of a drive, but rope swinging off a cliff into its chilling depths is worth the trek. The easy, half-mile hike in Idaho takes you through a forest, and is easy enough for tiny tykes. At the top, the stunning alpine lake awaits, surrounded by towering cliffs, pine trees, and a dusting of snow. Take a swing on the rope and jump into the icy waters to cool off during a hot summer’s day. You don’t need to own a boat to get your family on the water. Instead, take a tour with Cisco Charters. 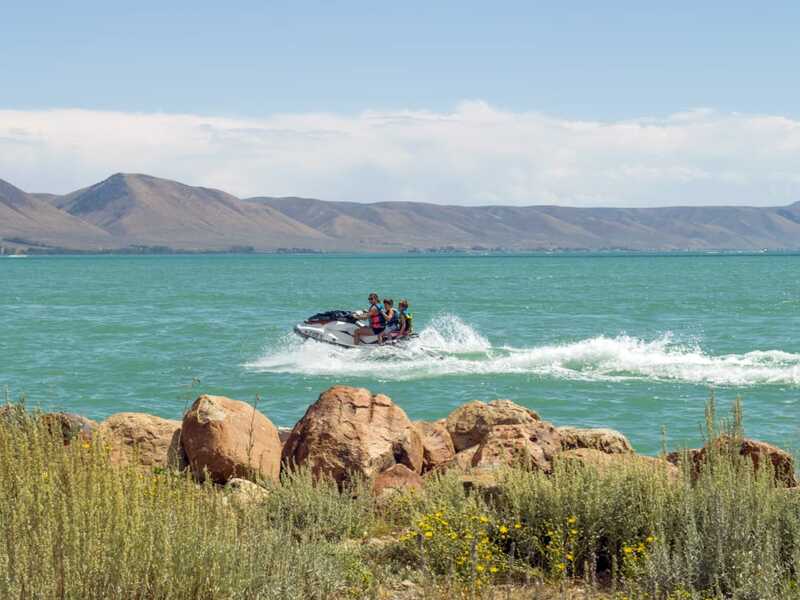 From the comfort of a 6-person, 20-foot pontoon boat, your family can learn about the formation of Bear Lake, the unique fish that live in it, the lake’s pioneer history, and local lore like the Bear Lake Monster. Idaho’s North Beach is a popular, sandy spot for lazing the day away, but it can get packed on a sunny day. On the Utah side, head to Garden City Park and follow and wooden trail through the grass to a free beach. Spend the whole day splashing in the turquoise waters thanks to amenities like outhouses, a shower, drinking fountain, and picnic table. When you’re ready to leave the beach, take a break and play at the local park. After a day spent outside, cruise by LeBeau’s for creamy shakes made with local raspberries. If your kids have a need for speed, don’t miss go karting around Renegade Raceway in Garden City. Little kids can drive—provided they stuff one of the available pillows behind them to reach the pedals—as the whole family races around the uncrowded, outdoor track. Written by Jenny Willden for RootsRated Media in partnership with Utah Office of Tourism.